This school science software (animation) completely covers reflection in a plane mirror including answers to question like "is mirror visible" ? The science software is very useful for students who want to understand the concept behind reflection. 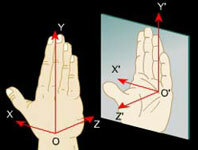 What is the angle of rotation an image undergoes if the mirror is rotated by an angle "a "? 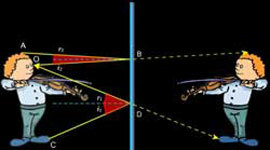 When a beam of light strikes a rough surface it is reflected in different directions over a wide area. Such a reflection is called Diffused or Irregular reflection. 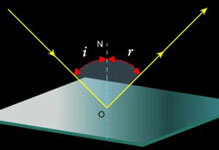 When a beam of light strikes a smooth surface it is reflected in a fixed direction. Such a reflection is called specular or regular reflection. 2.) The incident ray, the reflected ray and the normal at the point of incidence lie in the same plane. The image formed in a plane mirror is called virtual as it has no physical existence. The image formed in the mirror is laterally inverted. Lateral inversion refers to the apparent left-right reversal of the image with respect to the object. If you are still unclear about the concepts, please refer the animation . Ans: Lateral inversion refers to the apparent left-right reversal of the image with respect to the object. Ans: The critical angle is defined as the angle of incidence that produces an angle of refraction of 90-degrees. When a light ray approaches a less dense medium (air) from a denser medium (water) the bending is toward the surface. 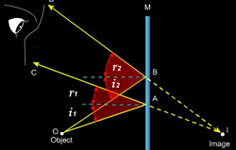 At a certain angle, the bending will be so high that the refracted beam will be directed right along the surface (angle of refraction is 90 degree to Normal) so none of it will get out into the air, the angle of incidence will then be the critical angle. Ans: When you look in the mirror the left side appears on the right and vice versa, for example of you are holding an apple in your right hand it appears in the left hand to you when you look in the mirror. This is called as lateral inversion, the mirror is thought to be inverting you, however this is an illusion, there is no left-right inversion, the mirror is simply reflecting back in a straight line every point on your body. Please refer our ambulance animation to understand this.